DENVER | The Regional Transportation District claims that high-rise growth in downtown Denver is one of the main reasons the district has faced ongoing issues with the metro area’s commuter rail network. A test train rests at the Peoria Station. That discovery resulted from an action plan the district submitted to federal regulators Friday and made public Monday. The document says Denver’s rising skyline around Union Station consistently blocks GPS signals the system relies on to maintain the University of Colorado A-Line running smoothly and safely. The plan says a software patch for that issue is expected soon, along with solutions to other factors in the crossing gate problems. 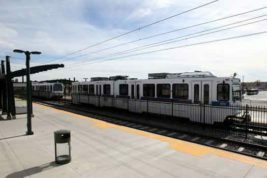 The district says it is ready to open the long-delayed G-Line to Denver’s western suburbs in the first quarter of 2019 if the Federal Railroad Administration approves its action plan.